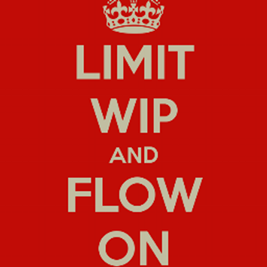 “Limit WIP” means limit the work in process — for any given step in your workflow you limit how many items can be in that state. So a WIP Limit of 2 on your “Develop” step means once 2 items are at that step, the team cannot start to develop any more items until at least one of the current items moves to the next step. You have a workflow where items come in, are developed, tested, deployed, and other steps towards Done (or “Live” as above). You want your workflow to… well…. flow. That is items come in, do not spend too much time in any given workflow step, and continuously and quickly emerge out the other end into the Done state. Items continuously reaching done is measured by “throughput”, the number of items done per time. Items quickly reaching done is measured by “cycle time”, the amount of time it takes from starting an item coming into the workflow, until it reaches done. Or they moved their focus downstream to work on code review or validation. In this latter case this moves those items downstream creating “open slots” in Code Review and Validate. Number 1 does not necessarily help in this case as there is nowhere for an item to move to once Develop is complete, since Code Review is also full. So developers instead focus on action number 2 and move items downstream towards the Done state. This creates space for items to move on from Develop and therefore creates space for items to move from Backlog to Develop. This is the “pull model” of Kanban in action. So perhaps non-intuitively, it is applying WIP limits that opens up that valve in the bulging water line picture above, focusing work downstream rather than continuously stuffing it into “the bulge”. There are also other actions besides 1 and 2 identified. Another one is called “slack” where developers take on tasks outside of the main workflow to improve things such as efficiency, operations, or addressing technical debt. Developers might even just read a book or take training, this is called “sharpening the saw”. Slack in excess is a sign of a problem, but a little slack is a good thing. As mentioned earlier, then a developer cannot pull in a new item into Develop due to a WIP limit, one way she can continue to be productive is by collaborating with other developers on an item already being Developed. Or perhaps she looks downstream and sees QA needs help, she can pitch in there and help the QA Engineer out (perhaps helping to build out some automation). The power of collaboration is getting multiple talents and multiple perspectives so that we arrive at the best outcome (pair programming also leverages this advantage of collaboration). But another advantage of collaboration is that stuff gets done faster, and getting stuff done faster was one of our goals (and a sign of good flow). In Scrum we plan a sprint, and as a team commit to completing the stories in that sprint, thereby delivering value with every sprint completion. In Kanban we usually do not have sprints, instead using a continuous flow model. 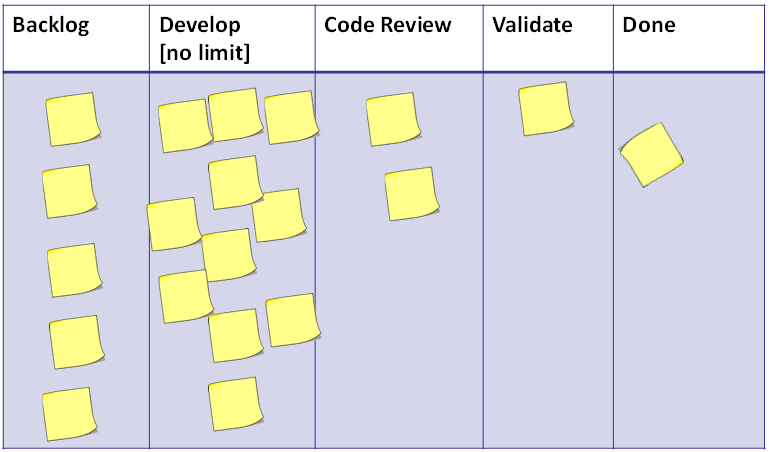 WIP limits are how we provide this same level of commitment that Scrum provides. In Scrum we plan a sprint based on past velocity, and then as a team commit that we will complete the selected stories for that sprint by sprint end. 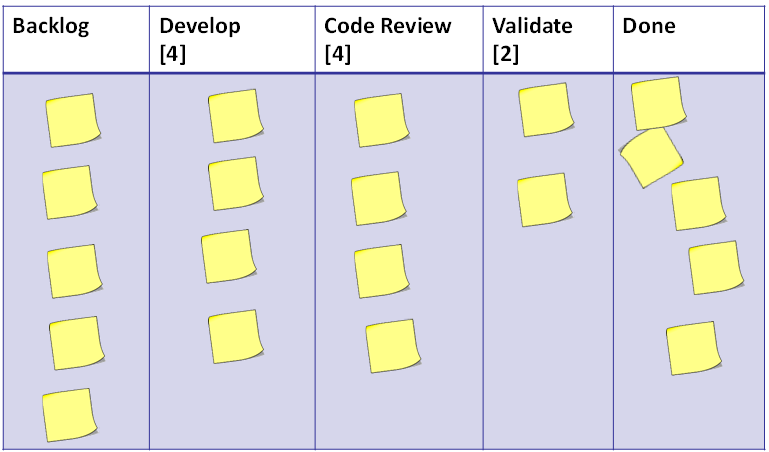 This commitment is an important part of Scrum, however I have observed that it is a very common problem among teams world-wide that they fail to complete all the planned stories for a given sprint. “Punting” unfinished stories from one sprint to the next is supposed to be a practice to be avoided, however it is in actuality common among even the best intentioned scrum teams. In Kanban, we often have a continuous flow model and not a sprint one, so the Scrum method of committing to a set of sprint stories will not work. We take a different approach to team commitment. By limiting WIP we commit to ensure that the most important things (the things the top of the backlog) get the teams’ attention, and that often multiple members of the team will collaborate to deliver those items. So in Scrum we might recognize half-way through the sprint that stories will not be finished, and then swarm on a select few stories in order to finish those and meet at least part of our commitment. In Kanban we limit WIP and we ALWAYS swarm to ensure we Stop Starting and Start Finishing. This entry was posted on Wednesday, July 20th, 2016 at 11:12 am	and is filed under Uncategorized. You can follow any responses to this entry through the RSS 2.0 feed. You can leave a response, or trackback from your own site.